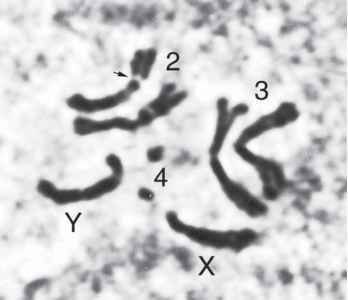 Acetic orcein staining of polytene chromosomes was introduced in 1941 (1) shortly after the initial studies on aceto-carmine-stained chromosomes by Bridges (2) and has remained a standard method of preparation. Orcein dye can be purchased in both its natural form as extracted from two species of lichens, Rocella tinctoria and Lecanora parella, and a synthetic form. The mechanism of staining is not clearly understood because the stain itself is a variety of phenazones, which may interact at an acid pH with negatively charged groups or possibly interact hydrophobically with chromatin. Acetic acid fixation accommodates stretching of the chromosomes in the interband regions during a squash, thus providing for a higher resolution of the banding structure. The later addition of lactic acid to aceto-orcein (3) kept the glands softer in the fix and allowed for easier spreading of chromosomes. The method and its variations have appeared more recently in several publications (4,5). The polytene chromosomes of D. melanogaster contain approx 3000 bands. The distinctive banding pattern of each chromosome has been carefully delineated in cytogenetic maps both by light (9) and electron microscopy (10). The standard system of map nomenclature (2) divides the 4 chromosomes into 102 divisions, each of the chromosome arms containing 20 divisions (X: 1-20; 2L: 21-40; 2R: 41-60; 3L: 61-80; 3R: 81-100) excepting the small fourth chromosome, which is divided into divisions 101-102. Each numerical division is further subdivided into six lettered sections (A-F), each section containing approximately six consecutively numbed bands. The bands vary in size and clarity, the more evident bands typically delimiting map subdivisions. Similar but less detailed maps have been published for many Drosophila species (11).